I had the opportunity to visit Tombstone Territorial Park in Yukon, Canada last week, together with a bunch of avid photographers, who had come from all over the world for this trip. While Tombstone does not have the commonplace reputation of other famous Parks such Yosemite National Park and Yellowstone National Park, Tombstone is fervently touted as a Holy Grail destination amongst landscape photographers – its pristine wilderness of rugged peaks, permafrost landforms and subarctic tundra valleys make for sublime landscape shots. The Journey to Tombstone Territorial Park, Yukon, Canada. Personally, I am not a big fan of camping, so I must admit I really wasn't keen on the trip at first blush. I felt like it would be testing waters that may be too deep for me, and so I was pretty reluctant to dive into it when Piriya first asked me to join in the trip. While I hesitated quite a bit, I am glad I eventually decided to go for it. The breathtaking views and unadulterated landscape of Tombstone left me in awe, and while I cannot describe in words what I saw and felt during those days I was there, I hope to do justice to the awesome place with my photos and modest write-up here. The sculpted ice walls inside an ice cave. Mendenhall Glacier. The trip started off with a side trip to Juneau, Alaska, to visit the Mendenhall Glacier Ice Caves. I managed to find a relatively cheaper way to get to Yukon via Juneau, so I figured I might as well leverage the chance to seek out some new ice caves there, before heading to Yukon. We set off for a morning hike to the ice caves before sunrise, wanting to avoid the crowds. We spent half the day exploring the caves, and because it was my second time there, I was on the lookout for new ice caves to photograph. Even though it was my second trip to the caves, I was still very much amazed by the caves. The sculpted interiors and the range of blues inside the caves continue to captivate me. Por in Mendenhall Ice Cave, Juneau, AK. We then continued our journey from Juneau, Alaska to Skagway, Alaska along the Alaskan Marine Highway, followed by a long bus ride from Skagway, Alaska to Whitehorse, Yukon. And after another 8 hours drive we finally arrived at Dawson City, Yukon. 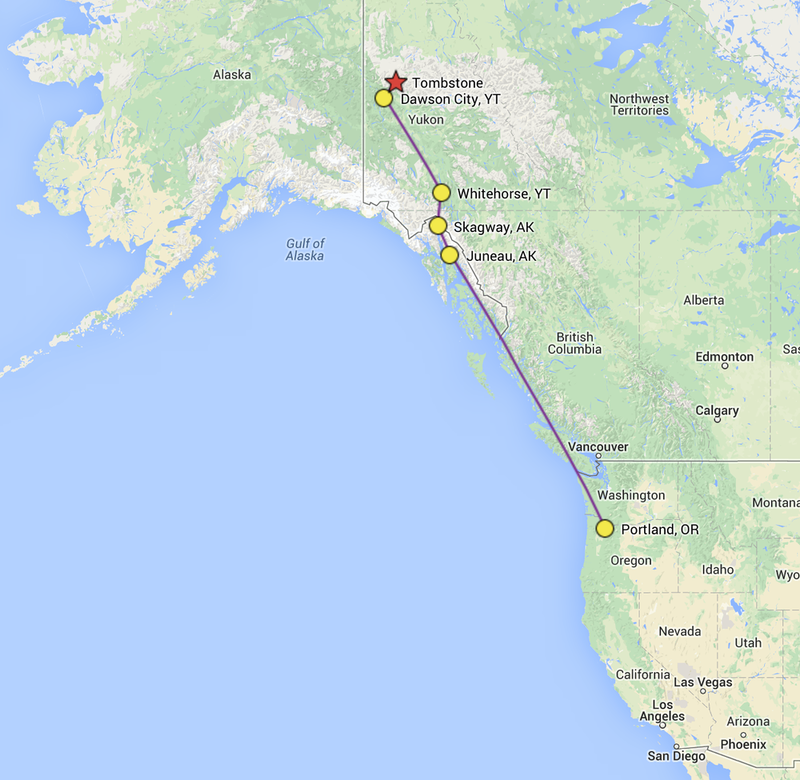 It was definitely a long journey to get to Yukon, but like they always say, no pain, no gain? We spent a night in Dawson City before heading to Tombstone. I had my first encounter with northern lights at Dawson City! The sky was alight was a pretty intense green glow, and it felt so surreal to be standing below the vastness of the sky that was painting a luminescent green picture in the middle of the night. Selfie with Talus Lake and Tombstone Mountain. The next day marked the start of our 5 days backpacking trip into Tombstone Territorial Park. We flew in by helicopter, and spent 2 days at Divide Lake and 3 days at Talus Lake. Being out there for 5 days without cell service and wifi is something I am not too familiar with. I must say it's quite a good break from the hustle and bustle of the world beyond where we where, as we basically had the entire place to ourselves. View from our tent after the 24 hours of snow. The weather at Tombstone can only be described as tempestuous. The weather was all sunny on the first day when we did our hike from Talus Lake to Divide Lake. So far so good, right? Not really. After setting up our tents at Divide Lake, it started to cloud over and soon it started pouring for the next 12 hours. The rain slowly turned into freezing rain and it eventually started to snow for the next 24 hours. I struggled to keep warm with layers, but the wind chill was debilitating. The predicted weather forecast of 0 to 15 degrees Celsius took a nosedive to range from -10 to 0 degrees Celsius instead. Por, Sara and our morning hike. Armored with only a base layer, a fleece, a windbreaker shell and some running gloves, I was in for a chilly hike that made the movie Frozen feel so familiar to me at that point, hah. We hiked back to Talus Lake in the snow, and the snow peppered terrain that we last saw bare looked vastly different, in a better way. 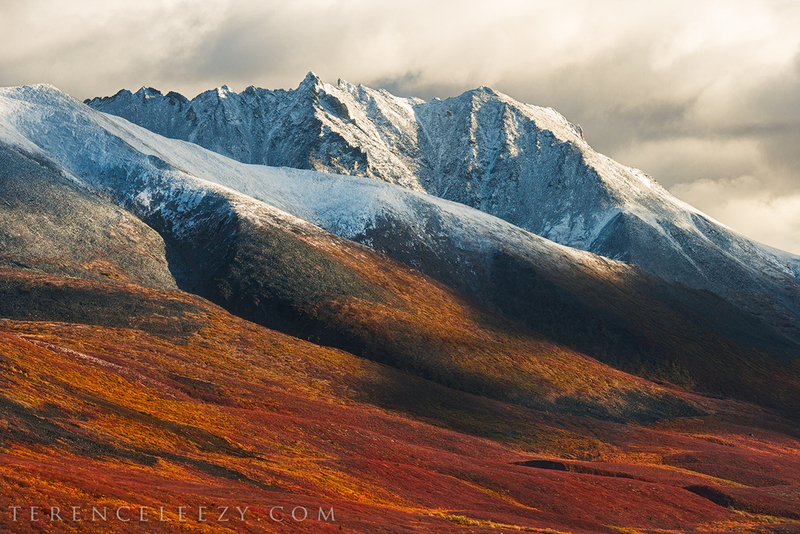 The snow accentuated the ragged peaks, and the frosty veneer added depth to the tundra valleys. While we were definitely unhinged by the cold, we were also very excited by the prospect of shooting the alluring scape before us. And so we spent the next 3 days out and about Talus Lake, enduring the frigid weather to get the best shots. During our trip, we were very conscientious when it came to monitoring aurora activity. On our 3rd night we had set our alarm hourly to check for aurora activity. Piriya got out of his tent at 1 am and shouted "Aurora! Aurora!" That got me all excited and I ran out of my tent, and was overwhelmed by the sky that was filled with green bands of dancing light. I was mesmerized by the orchestra of green waves, and watched them as they waxed and waned against the velvety night sky. I don’t think I would ever forget that moment. Our basic itinerary went along these lines: day hike, eat, sleep, scout for sunrise and sunset spots, eat and sleep. The cycle repeated itself for the 5 days we were there. The cold began to take its toll on us, as the 4th and 5th day was just too cold for everyone. The lakes had all froze over, and everything that had moisture became frosty; our clothes, our water, even our lashes. Even so, we pressed on through sunrises and sunsets, and stayed up for some aurora action at night. It was almost miserable, but the remarkable landscapes in Tombstone more than made up for it. Coincidentally, we bumped into the all time esteemed landscape photographer, Marc Adamus. It was a pleasure meeting him! Some of us were a little starstruck meeting him, hah. Here's a pic of the group (missing 1) with Marc Adamus. Our group photo with Marc Adamus. Top 5 highlights of the trip in no specific order. 5. Finally, a shout out to the most awesome companions for the trip! A giant grizzly bear that we met said hi.